Lay out slices of prosciutto. 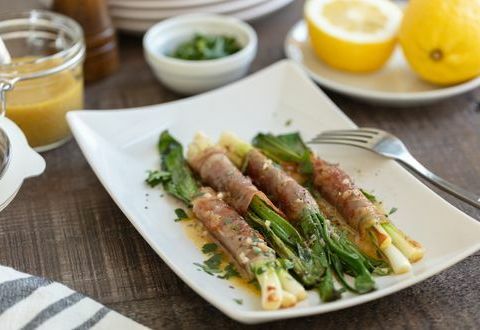 Gather 3-4 scallions per prosciutto slice; wrap the prosciutto around the white and lower green parts of each bunch of scallions. In a large sauté pan, heat olive oil to medium heat. Arrange wrapped scallions in pan. Cook, turning occasionally, until prosciutto is brown on all sides. In a medium bowl, combine the anchovies, Dijon mustard, shallots, lemon juice and white wine vinegar. Slowly pour in olive oil, whisking until combined. Season with salt and pepper.